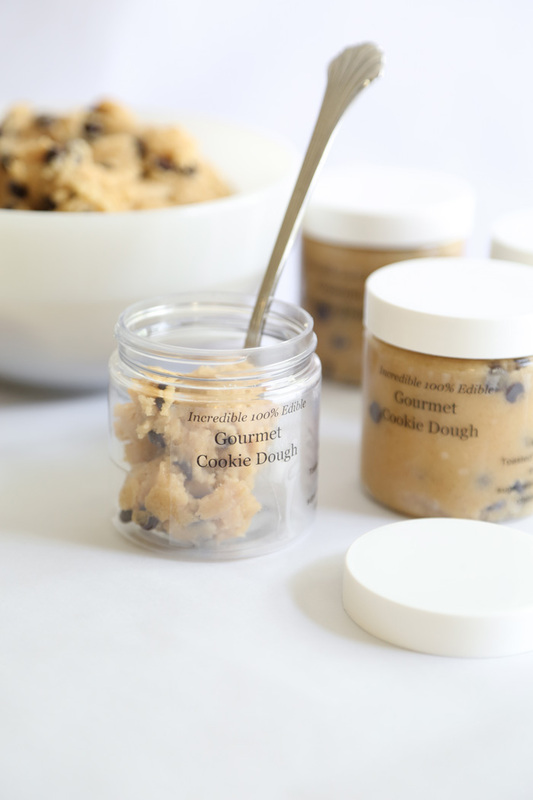 This year I'm adding something unexpected to my give-away cookie trays: gourmet cookie dough! I'm talking about the kind of dough you eat instead of bake. Do you think I'll get many complaints? Yeah, right! Who doesn't love delicious edible cookie dough straight from the batter bowl? This cookie dough is eggless, and 100% edible in its raw (read: un-raw) form. In this recipe, the flour is toasted before you use it as an ingredient. This makes the cookie dough completely safe to eat, as it removes any of the dangers associated with eating raw flour (E.coli, I'm lookin' at you!). Just place the flour on a baking sheet and toast at 300F for 10 minutes. You can also heat it in the microwave for 1 to 2 minutes, stirring occasionally until an instant read thermometer reads 160F. You can find the 4 ounce lidded jars I used here. They are PET certified, which means they are food-safe and recyclable. 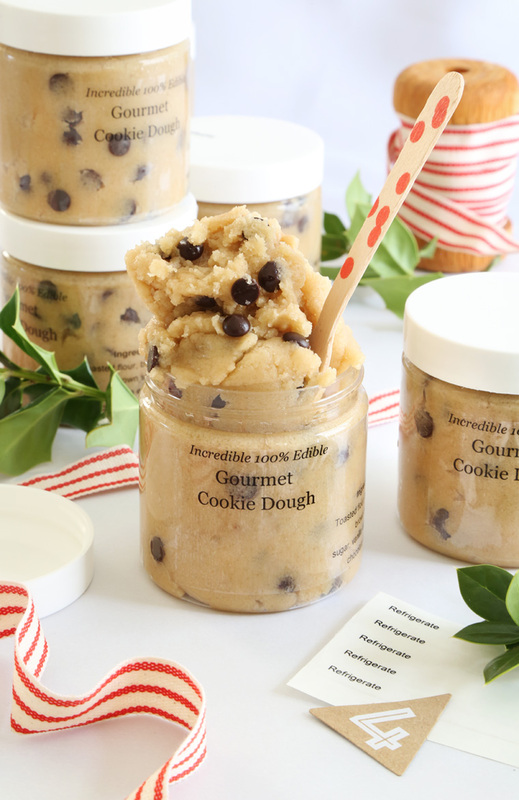 The chocolate chip cookie dough recipe provided makes a little more than the six 4 ounce jars can hold, but that just gives you a little extra to enjoy while putting these gifts together. Of course, you can use any food-safe container you wish such as Mason jars or - my favorite - Weck canning jars. Do you like the labels I designed? Okay, 'design' may be too generous a word, but spare as they are, they get the job done. I printed them on clear Avery labels and you can find them for purchase here and at most any office supply store. 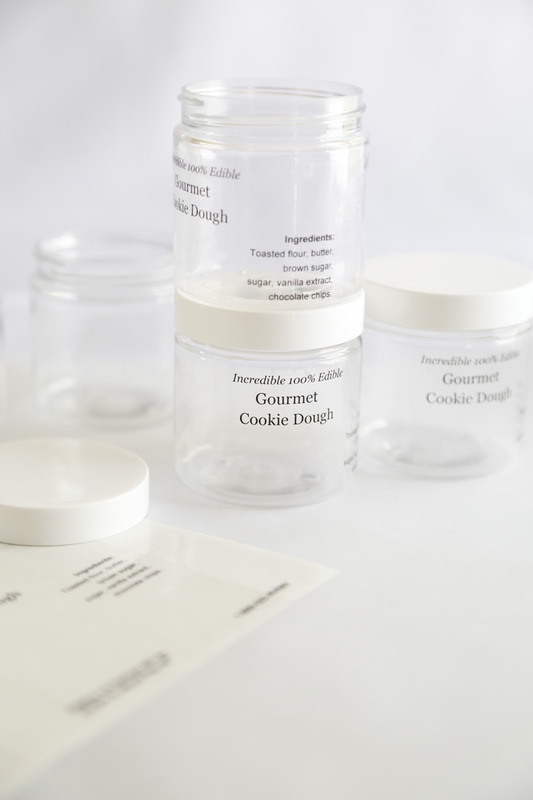 You can find the template for printing labels here, and if you'd like to add 'refrigerate' labels to your jars (I recommend) then you can find those here. I used scissors to cut the 'refrigerate' labels into long strips, and then adhered them to the tops of the jars and down the sides. This creates a tamper evident seal between the lid and the jar. I think it's a nice touch, and a good reminder to keep this treat cool! 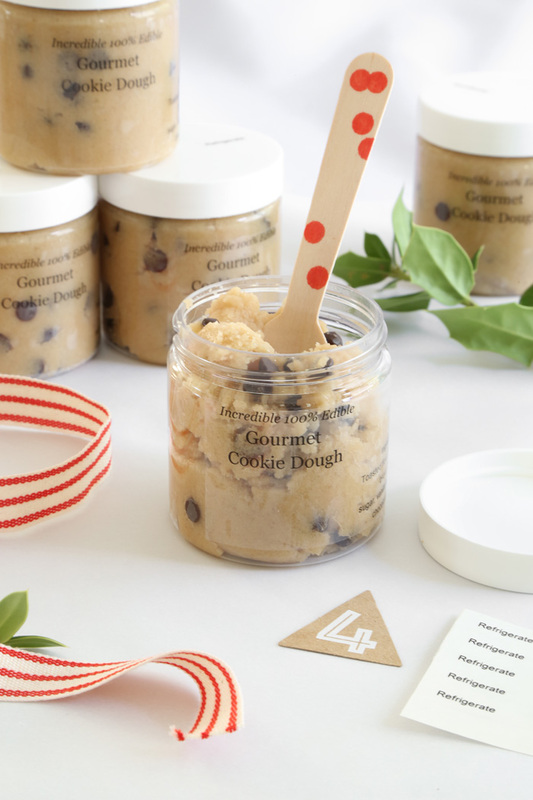 So, what is 'gourmet' cookie dough? In short, it's cookie dough made with the best ingredients around. The ingredients can be endlessly varied, but consider using your favorite specialty butter (I like French butter). 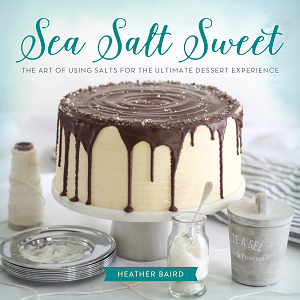 Sea salt, pure vanilla extract, and dark chocolate chips (such as Guittard) will make a big difference in flavor, too. Tie these jars up with stripey ribbon and maybe even include a festive spoon (or two) like these from Sucre Shop. Viola! 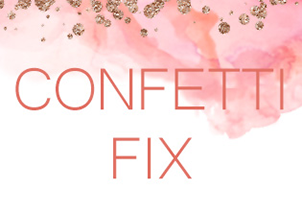 Instant gift without much hassle. I love sneaking a bite of this after dinner. Sometimes that's all I need: one bite. I've been known to use a larger dose when staring down a stack of gift wrapping (sugar = energy!). This recipe can be made up to 3 weeks ahead of time and stored in the refrigerator until ready to give. Place the flour on a baking sheet and toast at 300F for 10 minutes. You can also heat it in the microwave for 1 to 2 minutes, stirring occasionally until an instant read thermometer reads 160F. Let cool completely before using. In the bowl of a stand mixer fitted with the paddle attachment, stir together cooled flour, salt, brown sugar and granulated sugar. Pour in butter and vanilla extract. Mix until a dry dough forms. Add chocolate chips and mix on lowest speed (this is "Stir" on KitchenAid machines). When chocolate chips are evenly dispersed, add whole milk 1 tablespoon at a time with the machine on low speed. Scoop the cookie dough into six 4-ounce jars and twist the lids on tightly (nibble on the rest while you work). Print labels if using (see blog post) or tie on a hand-written tag. Include wooden spoons with the gifts for maximum cute factor! Rhoooooooo!!! The first pic is positively decadent! I want some! Now!!! Uncooked! Give me, give me, gimme!!!!!! So stinkin' cute as my friend Susan says:)Everything! I just saw some tubs of gourmet cookie dough at the grocery store. It was expensive! I think I'll make my own. This is the smartest idea and so cute! What a great idea, Heather! Wow! Have gotten many interesting tidbits of info from you, clever girl, you! The flour tip, will remember, as have collected a ton of "cookie dough"treats. "Thanks for including the "where to gets",as well. Am a young 54 still learning every day from all of the babes! In more ways than 1! 😂 LOL! thanks, Happy Holidays! OMG. I love cookie dough so much. I had NO IDEA that flour could be a problem to eat "raw". No idea! Thanks for the recipe and all the resources! Oh my gosh that would be wonderful gifts, So yummy!!! This looks so so good! I'm totally making it!!!! I love cookie dough. My eldest child is 50% cookie dough as I craved it so much when I was pregnant! I just made a double batch of these to give as gifts! They are absolutely delicious. And so decadent! 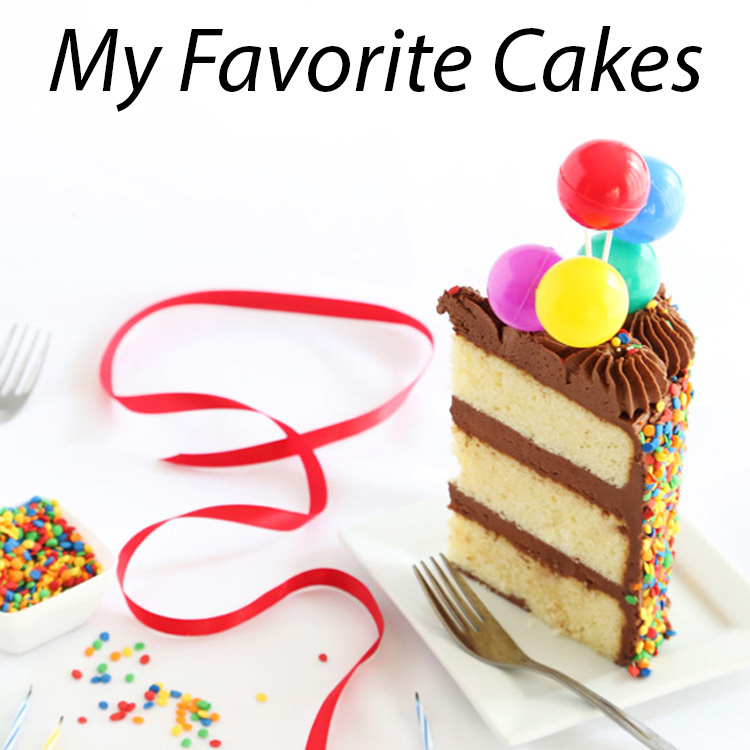 Can you bake these too? Hi Mary! I haven't tried baking the dough. I think you'd have to add an egg to the batch before doing so, otherwise it would make a very crumbly, dense baked cookie. I guess you need to specify if an egg is needed. Hate to give this as a gift and it is a flop from not knowing that. Otherwise a wonderful idea. I'm not sure I understand your comment. This toasted eggless cookie dough is not meant to be baked. It is meant to be eaten in dough form. Can you sub the butter and milk for vegan butter and almond milk? Hi Drea, I think that would work just fine. I've made some vegan treats for friends and used Earth Balance brand buttery spread and sticks as a substitute for dairy butter. It has good flavor, and I think it would be a-ok in this recipe. Almond milk should work fine, too. Thanks for asking. I made this as a truffle - I rolled the dough into balls and dipped them in melted chocolate for a cookie exchange. They were a delicious hit! Thanks! Hi! This recipe looks delicious! Can't wait to try it, but I have a question. How long will it keep once it is made? I want to gift it to someone but if it will not keep for a few days then I will need to change the gift. Thank you! There's a note just before the printable recipe that says the cookie dough can be made up to three weeks in advance and stored in the refrigerator until ready to give. The cookie dough has a refrigerated shelf life of about 5 weeks. OMG I have made this 4 times and still cant believe how good this is!! Makes great gifts with coffee and personalized mug or even some wine and a movie for girls night in or when life needs some comfort food! I probably won't get a reply in time, but I'll try anyway! 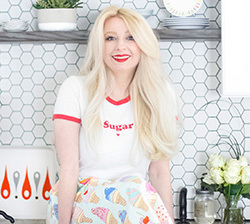 Can you do this without the stand mixer, because I definitely don't have one? I will be trying it anyway, because I've already bought the majority of the ingredients :) I am guessing/hoping it will just be more work and elbow grease, I hope! Decided to include white chocolate chips as well, just for fun. I'm so excited to try this, I am NOT much of a cook or baker, but this looked so easy and so delicious I couldn't wait to try it. Good morning , I wonder if you can replace granulated sugar, refined sugar by ? I'm from Brazil , do not speak very good English , the more hope you can understand . Thank you! I made this recipe last night but it came out with a dark color not light. Any idea why? Hi, this is Heather (not sure who Corinne is?). I'm not sure why your cookie dough would be dark unless you accidentally used rye flour or baked it for much longer. Can you tell me more? Did you wait for the flour to cool before you stirred in the chips? Oh my goodness!! Thank you for being so kind to post such a wonderful idea. I'm doing a display for our church (early) Christmas activity and this would be so fun to use on our display. This is just perfect!! Can this cookie dough sit out for 10-24 hours, after being refrigerated? Would like to use as wedding favors. 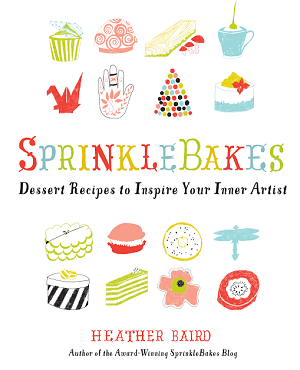 This is genius, Heather! Don't know how I missed it from last year! Loved your blog! So beautiful pictures and all food looks delicious! Hi Heather! How long do you think this cookie dough can be stored in the fridge for? Where can you find these 4oz food safe jars?